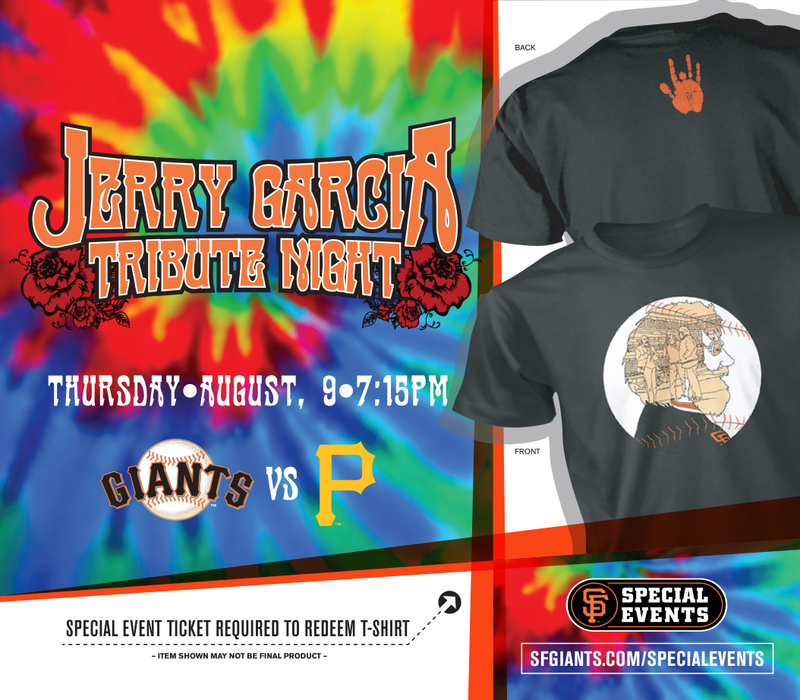 Jerry Garcia Tribute Night – A VIP Experience in Triples Alley Thursday, 8/9 vs. PIT 7:15 p.m. You and your family and friends are invited to a VIP Experience dedicated to paying tribute to of one of the most legendary musicians and San Francisco native, Jerry Garcia! Each VIP-ticket holder will receive admission to the Triples Alley Premium Location from 4:45-6:45 p.m., complimentary food and beverage (including beer and wine), the Special Event Jerry Garcia item AND the VIP Giants/Jerry Garcia item only available to ticketholders of this VIP offer! Unlike any other ballpark setting, this on-field space is the perfect place to enjoy all of the pre-game ballpark excitement on Jerry Garcia Tribute Night, as you will be treated to your favorite Grateful Dead hits! Triples Alley, the Giants newest Premium Location has it all, including early access to the ballpark, on-field access where you can watch batting practice, and at the conclusion of the pre-game event, a walk along the warning track on the field to get to your seats for in time for the first pitch! A portion of proceeds from every special event ticket sold will benefit the Rex Foundation. Buy Tickets Download Printable Flyer Moonalice is a psychedelic, roots-rock band of seasoned musicians mixing a variety of genres with extended musical improvisations that evoke a sense of adventure and exploration. Everyone is a part of the experience and the music inspires dancing and other acts of self-expression. Every show has an original art poster created by a well-known artist memorializing that event and given to all attendees…each poster has its own Moonalice legend. Moonalice plays mostly original material mixed with several covers, and during their extended freeform jams the band moves as one, drawing from many musical genres honed from years of experience playing with various major acts. Their single “It’s 4:20 Somewhere” has been downloaded over 6 million times.